I finally crossed an item off my bucket list: visiting the Midwest HQ of Field Notes! Mr. Three Staples and I have been thinking about visiting for a while, and during our recent trip to Chicago, we finally made it happen, on a beautiful, sunny day. I didn’t know what to expect, since it's not like we arranged a time with Field Notes (my schedule was up in the air until the last minute). We just showed up, hoping that we’d be able to get a tour of the studio without being too disruptive. I was a nervous wreck and totally unprepared, but Field Notes welcomed us with open arms, and really lucky for us, Jim Coudal and Bryan Bedell were both there. 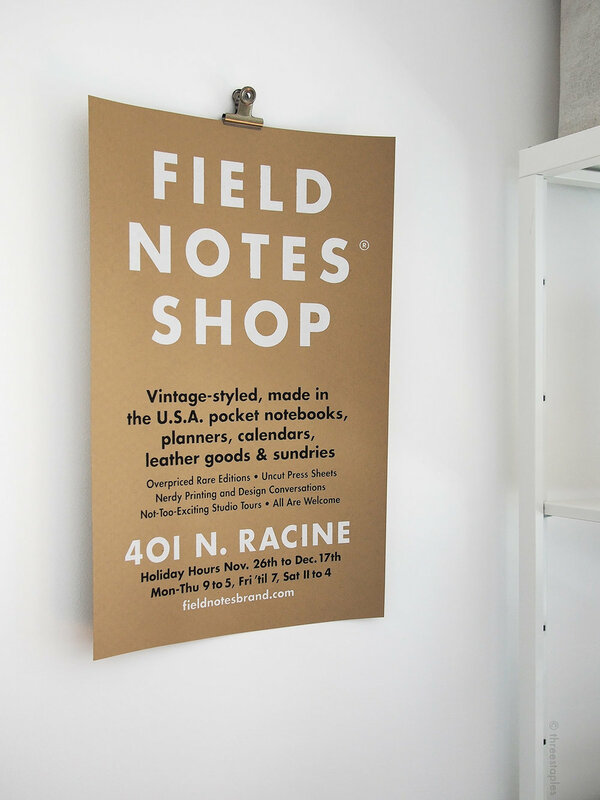 So here is my visit to Field Notes Midwest HQ! I know this is right on the heels of Priya's report on her visit to Field Notes, so I’m not sure I’m adding much. But pics or it didn’t happen, right? I do urge you to check out Priya’s post first at The London Parchment. How she got visit to Field Notes is a wonderful story, and she includes a lot of detailed information on individual editions and a more comprehensive set of photos of the HQ. I was a bit too nervous and preoccupied trying to soak everything up, so I didn't take as many pictures as I could have, but here they are. I'll add some things I learned as I present them and try not to repeat anything Priya already mentioned (but I probably will). The shop area that you first walk into, seen from the inside. You can’t see it from this angle but there was the “Power of the Pen” logo from Byline painted on the wall behind the register. Very cool. The other end of the entryway with black set of doors and some press sheets hung on the wall. Jim Coudal’s office is seen on the far right. For panoramic views of the HQ, watch these videos: 2016 Annual Report and Open for Business. Bryan and Jim were very friendly and welcoming! I was a bit starstruck, so I don’t know what kind of impression I left, but they were just as I've come to know them from various podcasts and videos I’ve watched them in. They walked me around various parts of the HQ, even upstairs where the rest of the FN crew were busy at their desks (hello! *waves*). I loved how much light was coming through all the windows. You could see the green of the trees outside through the windows and hear the train going by... I'm sure I'm romanticizing it but what a beautiful space to work in. And I must say, I was really surprised by how neat and tidy everything was. Maybe the open layout helps; I really expected a bit more chaos but that was not the case at all. We were also lead through the back areas where a lot of the action happens, like their stock room, packing and shipping room, screen printing room (where they print their own subscription boxes, shopping bags, posters, etc), photography room, even the bike storage room (see Priya's post for pictures). But even those areas looked well organized. Recognize the paintings hanging on the mezaninne level? They are by Brendan Monroe, the artist who made the illustrations on the XOXO Festival 2015 edition of Field Notes. By the way, there won't be any special XOXO Field Notes to look forward to this year. XOXO is taking a break, sadly. This is the lounge area on the main floor. Can you believe this former photography studio used to be all black? Now it's all white and airy with plenty of light. Another thing I learned: Field Notes’ old office used to be on a 3rd floor, and the logistics of shipping got to be a little too much over the years – one of the reasons they moved. The black-and-white mural you see on the right is based on an old photograph of a grocery store under the L-track, and it was specially commissioned by Field Notes. Of course, they made a fancy video showing how it was created – a must watch! A small library of a variety of books. Of course there were lots of design books, including the newest one from House Industries. Also spotted: Urbanlike magazine. Jim Coudal was particularly excited to show us the square, black clock at the top of the shelves, and how it worked. It’s hard to see because of the reflection of the windows on it, but it reads “It is twelve o'clock.” Watching it turn from 11:55 am to 12 was captivating, with small dots at the four corners counting down the remaining 5 minutes. Very neat. Emmys! And the complete Peanuts collection at the very top. Another view of the mural and the very large island table. Before they moved in, this space looked like this. A Drink Local coaster on a side table. I was told they don't have many of these left anymore. Some books and current standard offerings on top of a gorgeous coffee table. 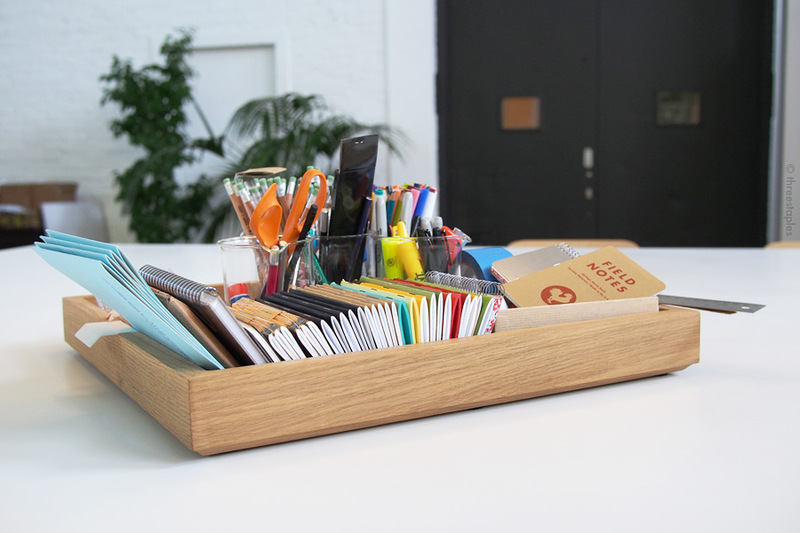 Various Field Notes products, including the Blue Books, on top of the main work table. Underneath this moveable high table were large storage cabinets, where I wanted to crawl in and hide until everyone went home. One of the coolest things about getting to talk to Bryan and Jim in person was that you could really feel their excitement and passion for what they do while they nerd out on details they achieved on their projects. Like the blue ruled lines inside the Field Notes Blue Books, aka Final Exam. Apparently, they are printed the old-fashioned way, by a printer that makes exam books, using strings to ink the lines! Jim Coudal said they really wanted to make exam books for themselves when they learned that’s how the lines were produced. They also wanted the cover to look lower in quality but it still ended up looking neater than they intended. I want this wall at my place. Notice all the quarterly editions that have ever been released lined up on the top “Not for Sale” shelf. Bryan said they’re going to need more shelf space for future releases! We sure spent quite some time here soaking in all the details and flipping through all the uncut press sheets (apologies for all the drool I left there). Jim and Bryan commented on several of them, especially the America the Beautiful one, and they delivered on “nerdy printing and design conversations” as advertised. Apparently, not all press sheets are out at the same time; more reasons to come back for sure! And boy, did I want all the ones I could see, especially the Night Sky press sheet, with holographic foil and everything. When asked about the Left-Handed edition, Bryan said it was a fun idea they wanted to try, and it had been requested by some fans; they were about to do another printing of “regular” Original kraft books anyway. He also told us some fun stories behind Kevin Guilfoile’s A Drive into the Gap, and we “bonded” over the struggles we face photographing paper things, particularly interior pages of memo books. I loved reading all Staff Picks, on kraft notes of course. And check out the rarities! Table full of samples, including Campfire (latest quarterly edition), Everyday Inspiration, and the newly-improved Daily Carry Memo Book Cover. This was undoubtedly the highlight of my trip to Chicago. For a Field Notes fan like me, it was like a pilgrimage. I mean, I've heard and seen a lot from their videos and whatnot, but to be able to see with my own set of eyes was a real treat. I really hope to visit again, maybe better prepared with more questions. “April 4th was the Chicago Flag’s 100th birthday. Represent!” Yay, Chicago! If you’ll be going to Chicago or you’re in Chicago already, I highly recommend you pay them a visit! They have a parking lot! And they give you a Chicago Field Notes memo book as a “guest pass”, and I'm not sure how many they have left, but if you spend more than $25, you get a set of Commemorative Reprints. They're really being humble, too, when they say their studio tours are “not-too-exciting.” Just don't do what I did, which is to ring the doorbell, only to run back to the car to get my wallet because I forgot to get something else at the shop; they’ll think you’re just pulling a prank.